Though we always pack Cocopotamus in insulated pouches with icy gel packs when shipping to warm places, the icy packs can only keep cool for 48 hours in most cases. It is important that if your local temperature is over 85°F, please choose 2nd Day Air or Overnight shipping for guaranteed freshness and quality upon arrival. If you choose Ground Shipping during the warm season, we will not be able to guarantee the freshness. Ground shipping is available during the summer months for NM, CO, UT, AZ and OK. All other states will require 2nd Day Air or Overnight shipping due to the distance. Monday - Thursday. EXCEPTION: We do not like to ship chocolate when it cannot reach the destination within the same week (particularly during the warm season). We do this to prevent the chocolate from being in FedEx over a weekend. We strongly prefer our chocolate to melt in your mouth, not in their warehouse. Because of this, we may hold your order until the following Monday. Ground, 2nd Day Air or Overnight. 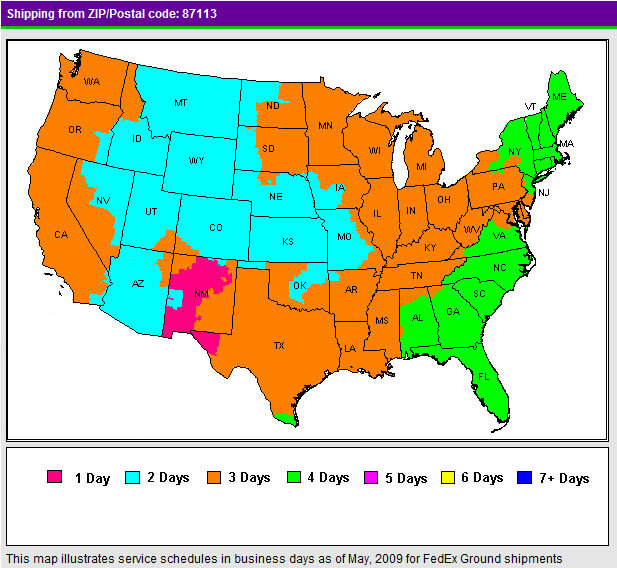 Following is the FedEx Ground Shipping map indicating the shipping time from our CocoKitchen in Albuquerque, New Mexico to the destination. Please select the appropriate shipping method according to your local temperature. Rule of thumb: select 2nd Day or Overnight shipping if your local temperature is above 80 degrees F.
You’ll receive an email from us confirming that your chocolate is on its way. There you’ll find a tracking number. Just click on it and it’ll take you to the shipper’s site where you can find out the latest. Or you can simply log in to “Your Account”, click on your order number and voilà, the tracking number will be there. 1. Please make sure that the shipping address is correct. FedEx will leave your truffles at the address you specified even if no one is available to sign for them. Cocopotamus will not be responsible for missing or stolen packages after they’re delivered as confirmed by FedEx's Proof of Delivery. 2. If you’re shipping the truffles to someone else as a gift, you should let them know that Cocopotamus will be arriving soon. Please inform them to take the truffles into the house and store in a cool place as soon as possible. If the weather is very warm, the chocolate can be chilled in the fridge for an hour. Otherwise, our truffles are shelf stable - no refrigeration is necessary. 3. No P.O. Boxes please. FedEx does not deliver to P.O. boxes.